Echelon Studios is a dynamic motion picture distribution company with a large and varied slate of films that are available worldwide on DVD. Among these is a compilation of six distinctly unique short films that have been carefully selected to provide "A purrfect time to spend with your cat!" 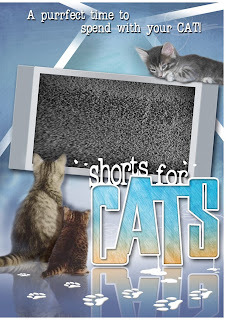 Ranging from nine minutes to twenty-six minutes in length, these independently produced films have been brought together on the first SHORTS FOR CATS DVD. Be advised, these short films are not about cats in any way. If they have anthing in common, they are all enjoyable to one degree or another and they are all worthy of representing those who devote their energy and their creativity within this overlooked but highly creative sub-genre. Perhaps Morris the Cat says it best, "Who me? Finicky? You betcha!" And the executives at Echelon were certainly that -- finicky -- in their choices. Not surprisingly, these six offerings are not equal to one another -- as the old Sears Catalog would say, here's "The Good," "The Better" and "The Best." DON'T LEAVE ME is the last of the six films and it's placement is most appropriate. This 15-minute psychological drama Written, Produced and Directed by Lyndon Ives has a twist ending I will not give away. The central theme of whether or not humans (women especially) can totally adapt to domestication is both intriguing and thought-provoking. Animal instincts and predatory desires are within us all, that's for sure, and the character played by Amber Coombs comes close to making a memorable statement. But, unfortunately, DON'T LEAVE ME fails to fully deliver on this ambitious premise. Perhaps with a bit more filmmaking experience Ives can succeed in what he has set out to do, but for now the best that can be said is, "close but no cigar." "Dogs have owners. Cats have staff." The other film that just barely misses the mark is THE FIGHT, by Nicholas T. Coming in at 22 minutes, THE FIGHT starts off with a bang. Cody Jones and Robynn O. Brooks exhibit strong and endearing on-screen chemistry as husband and wife during the first half of the film. Unfortunately, when the actual fight is staged between Jones and a Russian "ringer" (Segel Shisov), the momentum comes to a halt. A "no holds barred" extreme fight plays on screen as nothing short of lame. While the ending is predictable and the fight sequences lack any "punch," the winning performances of Jones and Brooks make this a short worth watching. DUEL is an exceptionally well-produced short that has been selected for screening at five divergent film festivals, winning Best Picture at the Hermosa Shorts event. These accolades are well deserved. The lush cinematography adds elegance to this intriguing tale of two killers who find themselves in an isolated tavern that is located in an uncertain time and place. This uncertainty regarding the "where" and the "when" enhances the impact of the eventual duel between Matthew Rimmer and Jonathan Fraser, two actors who play their roles to perfection, and there's no doubt that Director Dominic Antonio Cerniglio has a bright future based on this highly polished, 26-minute, near classic cinematic effort. "Thousands of years ago, cats were worshipped as gods. They have never forgotten this." Coming in at a mere 9 minutes, THE BIG BREAK features a toothpick-challenged, inept hitman (Luca Costa) and an aspiring actress (Pia Shah) who find themselves in the wrong place at the wrong time. Director Matthew Hals gets the most out of Costa, a natural when it comes to comedic timing and nuance. He literally steals the movie and, maybe, the heart of Shah as he "hits" on the vulnerable actress. Personally, I hope he does. Selected for screening at 28 international film festivals including Moondance, Vail, Edmonton and Crested Butte, and winner of the Gold Award for Best Live Action Film at Worldfest-Houston, NO MENUS PLEASE is sure to please any viewer -- human and feline alike. Richard Chang is nothing short of being today's "Great Stone Face." With a dead-pan expression as stoic and mournful as the great Buster Keaton, Chang engages in a small menu war which quickly escalates to what can only be described as all-out pamphlet rage. Bet you didn't realize such a thing was possible. Writer/Director Edward Shieh keeps the fun moving along with a deft hand resulting in a sly and totally enjoyable comedy. Perhaps the best of the best, LITTLE WINGS, Written and Directed by Morgan Rhodes, is a certified cinematic gem. With a running time of only 15 minutes, this official selection for the 2007 Cannes Film Festival tackles a subject matter -- child abuse -- that is considered taboo by many. Not since Chris Rea's "Tell Me There's A Heaven" on THE ROAD TO HELL album have I been so emotionally touched. 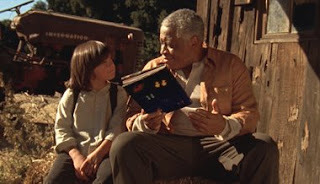 Joseph Castanon is outstanding as the young boy, while Ron Canada headlines a fabulous cast which includes Kelly Ann Ford and Robert Gantzos. If none of the other films had any merit whatsoever (and they all do), then SHORTS FOR CATS would still be worth every penny. I'm told that Ms. Rhodes is working on a feature-length version of LITTLE WINGS; here's hoping she succeeds. "Sufferin' succatash!" 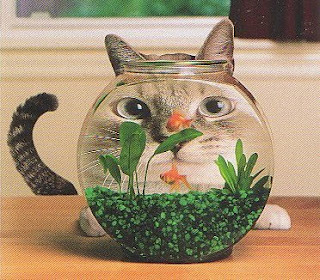 As you can see, there's clearly something beside the fishbowl for your cat to watch now that SHORTS FOR CATS is available through Echelon Studios and Singa Home Entertainment. To order a DVD go to www.singahe.com. The current price is $9.98.